The Israelites miraculously were delivered from Egypt. They were on their way to the 'Promised Land' ~ the land G-d promised to Avraham and then to his son Yitzak and to his grandson Yacov. While still in the desert, the L-rd spoke to Moshe of a place that they would come to one day.The place He was leading them. The place of His choosing. The place that He would put His Name. But you are to seek the place the L-rd your G-d will choose... to put His Name there for his dwelling. To that place you must go. It was not just any place. It was specifically chosen and would play an important part in the continuing relationship between G-d and His people. All of G-d's future plans for His children centered, not just around the Promised Land but more specifically a city. The city that He would mark with His Name. I will give one tribe to his son so that David will always have a lamp before me in Jerusalem, the city where I choose to put my Name. By practice, we know that when you write your name on an object, you are telling others that it belongs to you. Those who do not know you, may not know to whom the item belongs. If your name is written on your jacket collar , if you should forget it somewhere, someone need only look inside and see your name and know that it belongs to you. So it is with the things of G-d. He is particular about His precious possessions. He has His own way of marking what belongs to him~ of placing His Name. 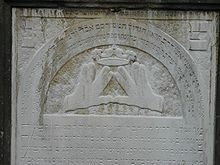 The name of G-d as represented by the shin is able to be seen written on Jerusalem. 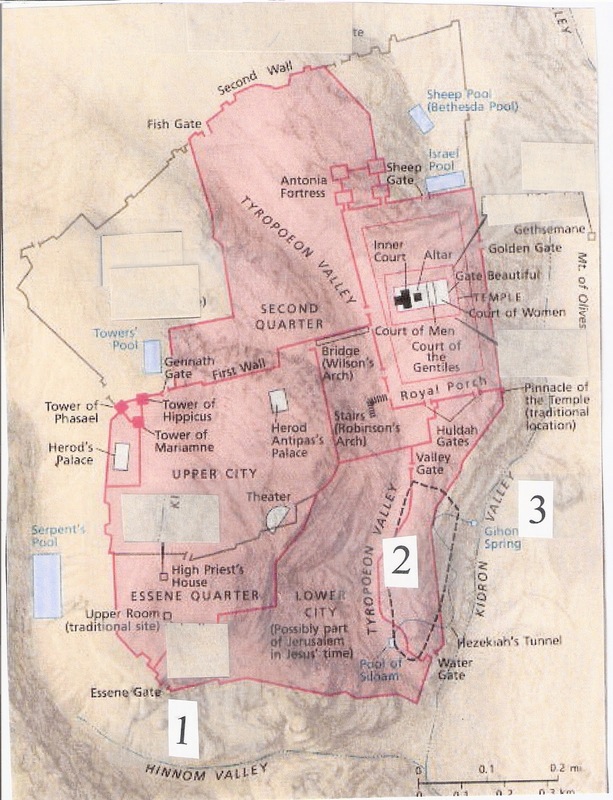 As we look at a map of Jerusalem, we see three valleys running north to south.The darker shaded areas to the left of the numbers on the map below show the valleys. #1 is the Hinnom Valley. #2 is the Tyropoeon Valley. #3 is the Kidron Valley. We won't go into the past and future significance of these valleys at this time. What we want to notice is the way in which the three valleys relate to each other. As you can see, geographically the three valleys form the letter shin. In an almost hidden and mysterious way, G-d has put His Name on Jerusalem. Just as He said He would. His Name was there before us. His Name was there before Moshe. His Name was there before Avraham. And His Name will be there always. A reminder of His greatness, a testimony to His sovereignty, an immovable sign of His covenant with the children of Israel~ the Jewish people. When I made aliyah in 1996, they were bombing buses in Jerusalem and Tel Aviv. My first apartment was on the route of one of the bus lines that was bombed twice. People where I came from were telling me, "Don't ride the buses!" "Stay away from public places!" Well, I couldn't afford a car, and I came to Israel to make music in public places. As I pondered the situation and how I would face it, it was as though the L-rd himself told me, "If you're going to be afraid, go back where you came from." I then understood that I could choose not to be afraid of the circumstances, and so I did. I thought of G-d's promise to Abraham, "Every place where you put the sole of your foot I will give to you and your descendants." And I began to put the soles of my feet in as many places as I could. I started with the buses and Jerusalem's bustling center. I opted to maintain a normal level of alertness on and around the buses. Yes, there ARE giants there. But I also decided never to avoid taking a bus because of fear. I took my banjo and started to make happy music downtown, including the occasional places that had been bombed. I tried to help to create a festive atmosphere of simchah wherever I went. Drivers sometimes even asked me to play music on their buses. I gave balloons to children. I enjoyed putting smiles on people's faces, especially in the places that were the most tense. I eventually branched out and began to visit other places in need of some senseless acts of simchah -- Hebron, settlements in Judea and Samaria, checkpoints, outposts, Gaza (before the Jews were forcibly removed from there). In the recent wars on the Lebanese and Gazza borders, I came to shelters with other entertainers to cheer up people living under attack. I even got to some tank units near the front to play for the soldiers. The land G-d gave us is a good land. Our people are a good people -- yes with lots of quirks and dysfunctions, but we are at heart a good people. Kindness, generosity, wisdom, courage and many other virtues dwell in us at truly uncommon levels. I have been in Jerusalem for nearly 15 years. Every day is a challenge. Miracles are part of our daily lives. I go to sleep exhausted after full days of work and activity, and I wake up early, excited to face each new day. When we were on our tour in Israel we saw a raised model of Israel. Our tour guide aksed,"What do you see?" I relied, "A shin!" He explained that it stood for Shaddai, the name of G-d. I was amazed. That was just one golden nugget of truth I received on this trip. Terrific Post! Just finished a study on the Names of God and the Book of Revelation. I like where 2Tim 2:19 says Yahweh knows those who are his. He has put a seal on Jerusalem His holy city and later puts His Name upon our foreheads. What a beautiful Lord God, YHWH our Elohim!